What exactly do we hope to achieve by the execution of Saddam? Will any of his victims be restored to vigor? Is it simply blood lust? And if so, shouldn't we torture Saddam first? After all, many of his victims would have preferred a neat and tidy death by hanging to the cruelties they suffered at the hands of Saddam's henchmen. So if we think that 'simple justice' demands a life for a life, then such simplistic formulas should lead us to support prolonged torture too. And note that here I'm talking about good old fashioned torture for torture's sake (as profoundly described by that nut job in Tarantino's movie who cuts off the cop's ear). None of this pansy 'he has information about terrorist plots.' No, I refer to wholesome pain inflicted simply because it makes the torturer happier. Now if (as I hope) most readers recoil from these thoughts and conclude with a huff that I am engaging in caricature'GOOD. Now you understand why I oppose hanging Saddam. Indeed, killing Saddam will have precisely the opposite effect that many believe. As hard as it is for most Westerners to understand, Saddam has his supporters. After all, he wasn't a dictator for decades because of his Kryptonian birth. On the contrary, for whatever reason many people chose to follow this disturbed man. Killing him in a US kangaroo court will only ensure his martyrdom. Did John Wilkes Booth achieve justice for the Southern states? The case of Booth leads right into the next point, sure to anger the American patriot who may be reading this article. My point is this: Is what Saddam allegedly did'namely, massacring hundreds of villagers after a failed assassination attempt on his life'really that outrageous for the class of parasites who exercise political rule in this world? We've seen what the civilized American troops do when residents from Fallujah desecrate two Americans; I daresay more people died in this 'crackdown' than in Saddam's retaliatory strike. Now some people might argue that Saddam's execution will serve as a deterrent to other dictators. I hardly think so. For one thing, the type of person in a position to engage in mass killings of his own people can't exactly act as a pussycat, so the danger of a foreign-invasion-that-sets-up-a-war-crimes-court-and-kills-you isn't a very relevant concern. What I mean is this: In the type of regime where a strongman rises to the top and has a culture of violence and unbridled power that would allow widespread murders of dissidents and so forth, it is quite necessary to act like, well, Saddam. To argue that his hanging will deter other tyrants is a bit like suggesting that drive-by shootings will deter drug dealers. As far as lessons to be learned, if I were a dictator the 'news you can use' would be this: ACQUIRE NUCLEAR WEAPONS AS QUICKLY AS POSSIBLE. This is the only way to keep 'liberators' from offering their assistance to your subjects. As Saddam's case showed, even if you do exactly what the world president tells you to do, you can still watch your country invaded and yourself sentenced to death. One last treasonous observation: Isn't it a bit ironic that the crimes for which Saddam will be killed'at the approval of George Bush'occurred before the below photograph was taken? 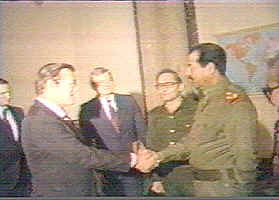 Either Rumsfeld knowingly shook hands with a war criminal, or he and his staff were woefully incompetent (or both). And these are the bungling killers that the American public reelected. Thomas Hoyt is a retired teacher who lives in Nashville, TN. Vendetta: Heroism, Terrorism or Patriotism?